Bright and Breezy Crafts: Embossing. the theme is "embossing... dry or heat"
It is a lovely crisp image and gorgeous to colour. using one of my embossing folders. I used Glossy Accents on all the bubbles. and finished by inking the edges of the frame . Beautiful embossed frame! Love your pretty image, so beautifully colored. Thanks for joining us at Just Us Girls! I can see why you wanted to use this embossed frame, it is gorgeous! I love the embossing and the mermaid is colored beautifully. It looks like she is just popping out of the frame. 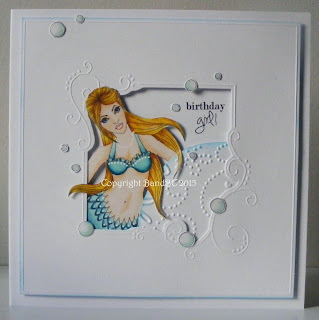 Your embossed frame with that pretty mermaid is beautiful! Love the soft colors and the Glossy Accents bubbles. Thanks for playing with us at JUGS! This card is beautiful. Love the embossing folder. Thanks for joining us this month at Doodle Pantry. I love that pretty embossed frame, and the bubble scattered about are such a nice touch. Wow this is awesome! Love how she is coming through the opening! Beautiful coloring and design. Thank you for playing in our neighborhood this week! Ooo, wow, that's a gorgeous image..love how you used it with the frame. Thanks for playing with us this week at Sentimental Sundays!